Theatre 232, the collaborative summer theatre festival run by UNCG Theatre and Triad Stage, will produce three shows for its 2012 summer lineup. Tickets for all performances may be purchased by calling Triad Stage at 336-272-0160 or online at www.triadstage.org. “Winnie-the-Pooh” brings the beloved characters from the books by A. A. Milne to the stage of Brown Building Theatre on the UNCG campus. 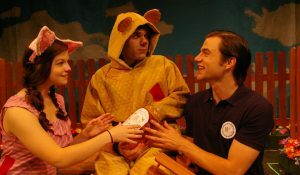 Dramatized by le Clanche du Rand and directed by Annika Pfaender, theatergoers of all ages will join Winnie-the-Pooh and his friends for classic adventures in the Hundred Acre Wood. While Rabbit frets over Kanga’s arrival with her bathtub, Pooh and Piglet are busy hunting a heffalump and searching for a missing tail. At the end of a day filled with friends both new and old, Christopher Robin’s pals work together to cheer up poor Eeyore on his birthday. The play will be performed at 11 a.m. June 16, 23 and 30; 10 a.m. June 21-22 and June 28-29; and 2 p.m. on June 23 and June 30. Tickets to the shows are $10 general admission; $7 for children, students and seniors; and $5 for groups of 10 or more. “The Illusion” by Tony Kushner has been freely adapted from Pierre Corneille’s “L’Illusion Comique.” The story centers on the mysterious lair of the sorcerer Alcandre, where Pridamant seeks to learn what has become of the son he banished years ago. The magician conjures three separate moments from the young man’s life; each finds him in a different location and with a different name. As the mysterious scenes progress, passions ignite, allegiances shift and the unhoped-for comes to pass until Pridamant discovers the unexpected truth about his son. Take a comic trip into the world of wizardry where romance, wit, action and adventure come alive at every turn. The play, directed by Preston Lane and performed on Triad Stage’s main stage, will perform at 7:30 p.m. June 10, June 12-14, June 17, June 19-21, June 24, June 26-28 and July 1; 8 p.m. June 15-16, June 22-23 and June 29-30; and 2:30 p.m. June 17, June 24 and July 1. Tickets to the play are $44-$32. Triad Stage is located at 232 S. Elm Street in downtown Greensboro. In “Fashionistas, A Narcissitic Love Story” by Janet Allard, the House of Narcissus is gearing up for the fashion show of the season, but life on the runway can be treacherous. An activist plots to destroy the show, the supermodels can’t find their shoes, Echo is in love with Narcissus, and Narcissus is consumed by the one thing he can never obtain: himself. In this world of unrequited love, insatiable desire and fabulous clothes, what is the cost of falling in love with illusion? This high-fashion adaptation of the classic story of Echo and Narcissus is directed by Jim Wren. The play will be performed in the UpStage Cabaret at Triad Stage immediately following the evening performances of “The Illusion.” Estimated start time is 10 p.m. June 20-21 and June 27-18; and 10:30 p.m. June 22-23 and June 29-30. Tickets are $15.